Welcome to episode 59 of your favorite arcade, video game, and pinball hobbyist podcast! In this episode a new Alien Pinball playfield reveal gets us thinking about all the great alien-themed games, so of course we made up our list of the top 10 classic arcade games involving aliens. While that conversation certainly takes up a large portion of the show, we also take some time to share our thoughts on the brand new Spider-Man Vault Edition pinball machine from Stern Pinball. This episode of the podcast is brought to you by the folks over at Wizard World Portland Comic Con & Gaming. Click this link or the image above to enter to win a set of passes for the event on February 19-21 in Portland, OR at the Oregon Convention Center. Thanks to Wizard World for offering this giveaway for our listeners! 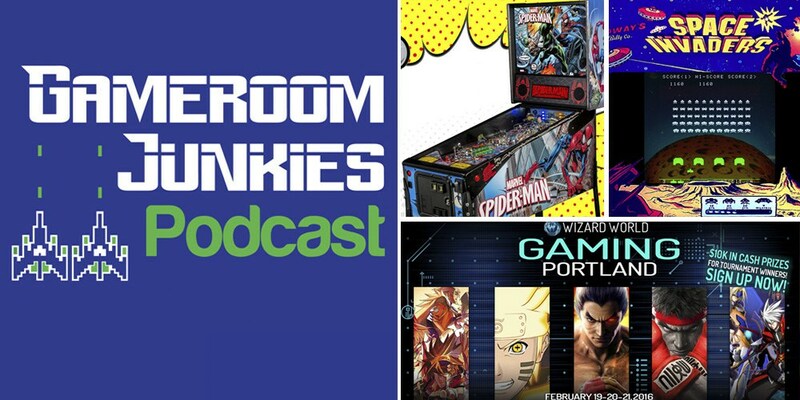 Don’t forget, you can listen to Gameroom Junkies by using the streaming player above, or you can subscribe to us on iTunes or Stitcher. If you like the show, please leave us a review. And remember, you can help support the show and save 10% on your next PinballBulbs.com LED purchase by using the code “gameroomjunkies” at checkout. You can find us on social media though Facebook and Twitter. We hope you enjoy the show and remember, if you enjoyed the show please write us a review on iTunes or click the “Donate” button at the top of the screen. Is there a place to download this directly?